The State Flag of Arizona features a large central copper star, representing the copper mining industry, with 13 rays of the sun. It serves as a symbol of honor, heritage and regional pride and is displayed at state buildings. The Arizona Flag is also flown on national and state holidays and on any other days proclaimed by the governor. There is an Order of Precedence for flags. State Flags are displayed in order as they entered the Union. Car Flags are often displayed to represent of an individual's allegiance to their state. Arizona State car flags are used by their owners as mobile emblems of their home. Car flags are usually made from strong materials and are attached to a car via a pole and clip window attachment. What is the design of the Arizona state flag? "Blue and gold are the colors of Arizona. Red and gold are the colors carried by Coronado's Expedition of 1540 to the Seven Cities of Cibola. The blue is "liberty blue" identical to the color in the United States flag field of stars. Since Arizona is a western state the rays of the setting sun seemed appropriate. There are thirteen rays representing the original "thirteen colonies." The large copper star identifies Arizona as the largest producer of copper in the United States." What are the colors and what do the heraldic colors symbolize? Who designed the Arizona State Flag? 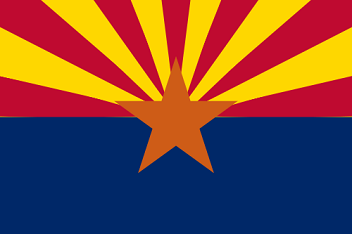 What is the history of the Arizona Flag? The first 13 colonies, represented by the 13 rays of the sun, were Delaware, Pennsylvania, Massachusetts Bay Colony (which included Maine), New Jersey, Georgia, Connecticut, Maryland, South Carolina, New Hampshire, Virginia, New York, North Carolina, and Rhode Island Providence Plantations. The Arizona flag is kept and used as required by the code specified in the constitution of the state. Official Arizona Nickname "Grand Canyon State"